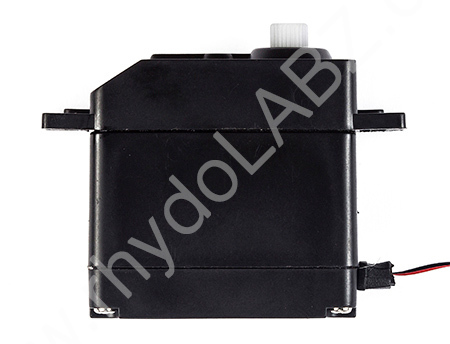 Description: This Continuous Rotation Servo can be used for your robotic development needs. This comes with a standard 3 pin power, control cable and all the accessories as shown in the image. I have been using this product for some time for some heavy lifting applications, its seems to hold on without any issues, only the wheel seems to wear out. How to use it for forward and backward rotation? The Signal pin of the servo connector carries the control signal, used to tell the motor where to go. This control signal is a specific type of pulse train. The pulses occur at a 20 mSec (50Hz) interval, and vary between .5 and 2.5 mSec. The Pulse Width Modulation hardware available on a microcontroller is a great way to generate servo control signals.It’s typically set so that a 1.5 mSec pulse stops the motor. Shorter pulses( from 1.5 to.5 mSec , Highest speed at .5 mSec) will cause it to turn counterclockwise, and longer pulses(1.5 to 2.5 mSec , Highest Speed at 2.5 mSec) cause it to turn clockwise.